important trends. 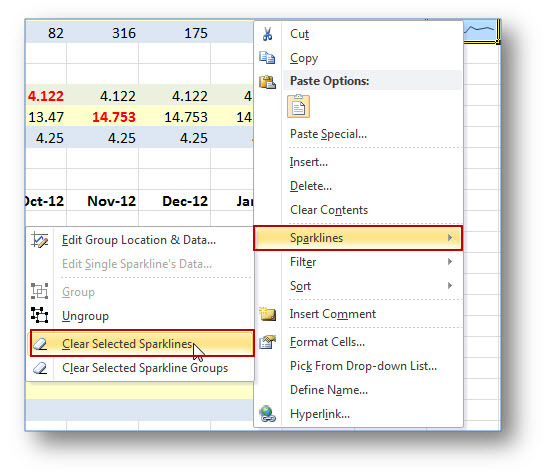 In this blog, I’m going to show you how to create Sparklines in your spreadsheet. This is a spreadsheet of the amount of gas and electicity used month by month. We can use Sparklines to where the peaks and troughs in the usage are. First, select the cell or cells where you want your Sparklines to appear, then go to the Insert tab on the Ribbon and select the Sparkline you want from the Sparklines group. I have chosen the line chart to help me identofy te trends in usage. You will notice that I have highlighted 3 cells, N18 to N20, because I want 3 separate Sparklines, one for Gas Units Used, one for Electricity Day and one for Electricity Night. This ten opens the Create Sparklines dialogue box. You need to enter the data range you want the individual Sparklines to use. You can either type this in manually in the Data Range: field, or you can highlight the fields with your mouse. Now click OK – don’t worry of the Location Range: appears to have cleared, when you click OK, the Sparklines will apper where you originally highlighted. Your Sparklines now appear in the original location. To remove Sparklines, select the Sparklines you want to remove, right-hand click > select Sparklines and then Clear Selected Sparklines.